Told you never count Nicky out in the wet! You certainly did! Fingers crossed for a good finish! Just read Spies has retired! It's on SuperbikePlanet and MotoMatters. Yeah, I read that too. He just kept crashing and crashing. I guess the MotoGP bike was just too much?!?! Too bad, I was hopeful for another American too cheer for since Nicky and Colin are "getting up there". 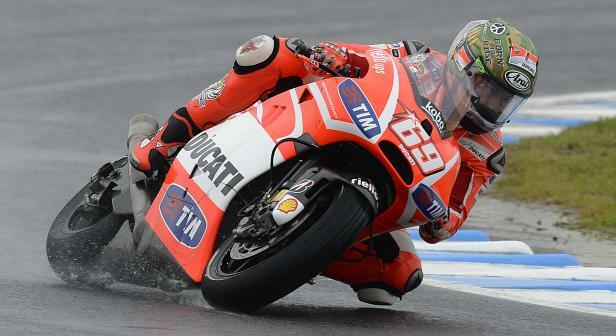 That's amazing seeing how far over he has that Ducati in the wet! Can anyone point out where/when I can dvr(or download) a re-air? I accidentally recorded moto2. I have Verizon FIOS and will get all 3 races on Tuesday on FoxSports2 in HD. On Sunday I got MotoGP on FoxSports1 but not moto2 or3. Sunday FS1 on comcast aired Moto2 race @3 and the MotoGP @ 4. I searched and found a re-air like you said on FS2 but we aren't offered that channel. Nice!!! Watching this and F1 is seriously taking up all my freetime. Exciting stuff though, Vettle won F1 and now this is going on. Its crazy how good they can be in the rain even still..
Look at the higher HD Channels. FS1 is channel 83 but FS2 in HD is 198. Of course Comcast could be different but I don't see why FS2 programming would be affected. Got it! I downloaded the BBC coverage. Light years better than what we see.